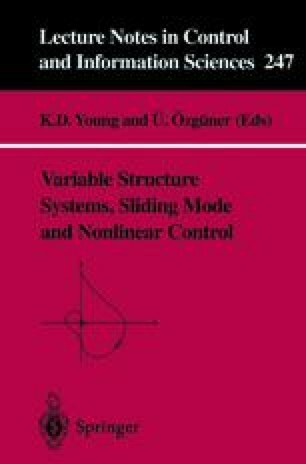 The main contribution of this chapter is a new Park vector based variable structure control (VSC) method. In this chapter an inverter is taken to be a member of Variable Structure Multy Imput Multy Output System. The design of a sliding mode controller consists of two main steps. Firstly, the design of the sliding surface, secondly, the design of the control law which holds the system trajectory on the sliding surface. Here a complex (Park vector based) sliding surface is proposed. The distance of the system state from the complex sliding surface measured by a complex vector. The inverter is switched in such a way that the system trajectory gets as close to the sliding surface as possible. In other words the complex distant vector should be decreased. This chapter focuses on the switching rule. Two switching strategies are compared. In the first approach, sliding mode exists only in the intersection of the switching surfaces. In the second approach a stable sliding mode may exist on any of the switching surfaces independently. A modified definition of the Park vector is introduced to handle the effect of zero phase-sequence component caused by an asymmetrical load. Experimental results of a 100 KVA inverter are presented. The authors wish to thank the Japanese Society of Promotion of Science and the Control Research Group of the Hungarian Academy of science for their financial support.